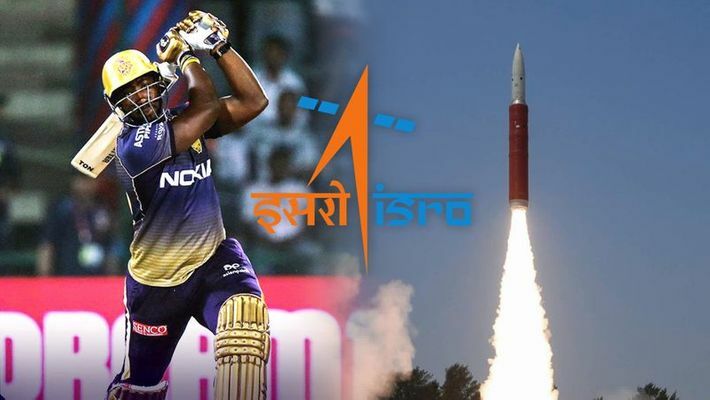 A new petition has been floated by franchises participating in the IPL, urging Indian agencies ISRO and DRDO to come up with an Anti-Russell Sixer Missle next. The petition has been signed by the captains and owners of all teams, barring the Kolkata Knight Riders. According to MyNation sports correspondent Varsha Dhoble, the appeal was initiated by Kings XI Punjab spinner Varun Chakravarthy, who was on the receiving end of a flurry of massive sixes from KKR's swashbuckler Russell in a recent game. "There are only two ways to get him out — one is the Ashwin method, when Dre Russ is at the non-striker's end. But when he's on strike, the only way to get him out is to fire a missile at the white ball when it is high in the air and deflect it to a fielder's hand. And given that ISRO and DRDO have achieved nothing short of a miracle last week, this should be child's play for them. I really hope they develop this Anti-Russell Sixer Missile before the next KKR game. That's the only way this contest will be even," an upset Chakravarthy told Dhoble. Many Congress leaders showered praise on Russell, but said the credit ultimately goes to Nehru. "Russell is smashing the ball like a dream alright, but one must remember that it was Nehruji who constructed many of these beautiful stadiums all over the country. If it weren't for him, Russell couldn't have hit the ball like this anywhere here!" said Congress spokesperson Randeep Surjewala. It wasn't long before the BJP responded to the Congress claims. "Randeepji is right. It is all because of Nehruji. If Nehruji had built cricket stadiums with roofs, Russell wouldn't have become the monster that he is and there wouldn't have been any need for such a petition. The country is still suffering due to the first Prime Minister's misgovernance," screamed BJP spokesperson Sambit Patra. Congress president Rahul Gandhi, however, came out in support of the petition. "It is better to destroy the white balls before they go out of the stadium. Because once they do, Narendra Modi is going to pick them up and hand them over to Anil Ambani. He is already giving him 72,000 crore cricket balls every month!" he thundered... oops... squealed. Sources in Bengal have claimed that chief minister Mamata Banerjee and Trinamool leader Derek O'Brien are frantically trying to reach out to Russell, hoping to gift him a Lok Sabha election ticket. "The Bangladeshis have assured him that they can give him his Aadhaar card faster than he hits a ball out of the ground. Anyway, if he doesn't accept our offer, I'm afraid I'll have to name him in Parliament," Brien said. While neither the ISRO nor the DRDO have reacted to the appeal so far, Pakistan Armed Forces spokesperson Major General Asif Ghafoor has issued a statement, claiming that Pakistani jets have just shot down and defused a couple of white Kookaburra bombs which were fired by India. "We've also nabbed two Indian pilots, who might've dropped them," Ghafoor added.